I'll be honest--the idea of eating flowers is a bit weird to me. Now, I don't mean broccoli or cauliflower or capers. I'm talking about those heavy-smelling, colorful, meaningful-gesture-type flowers. I've never eaten squash blossoms or anything rose-flavored. Jasmine isn't my cup of tea and I've never even seen daisies that were meant to be consumed. Everything changed when I received some lavender buds with which to play and promptly decided to combine them with lemon for a particularly refreshing and floral batch of spring-appropriate cupcakes. How did they turn out? 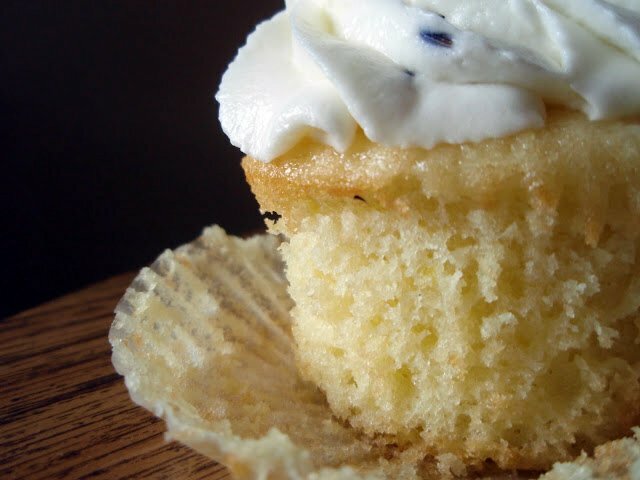 The cupcakes are fluffy and bright with citrus, and the curd provides a powerful note of lemon that's necessary to compete with the lavender in the frosting--it's potent stuff! All in all, there's a nice balance between the two dominating flavors, and the light frosting was the right choice to pair with the curd-laden cupcakes. Go on--embrace spring while it's still around and before the whole heat of summer barges in! In a heavy saucepan, whisk together the egg yolks, sugar, lemon juice, cream, and butter and cook over moderately low heat, whisking constantly, 5 to 7 minutes, or until mixture just reaches a boil. Strain the curd into a bowl and stir in the zest. Cover the surface of the curd with plastic wrap and chill at least 4 hours and up to 2 days. To make the cupcakes, first preheat oven to 325 degrees. Line standard muffin tin with paper liners. Whisk together flour and salt. With an electric mixer on medium-high speed, cream butter and sugar until pale and fluffy, scraping down sides of bowl every few minutes. Add citrus zests. Reduce speed to medium, and add vanilla. Add eggs, three at a time, beating until until incorporated, scraping down sides of bowl as needed. Reduce speed to low. Add flour mixture in four batches, beating until completely incorporated after each. Divide batter evenly among lined cups, filling each three-quarters full; tap pans on countertop once to distribute batter. Bake, rotating tins halfway through, until a cake tester inserted in centers comes out clean, about 20 minutes. Transfer tins to wire racks to cool 10 minutes; turn out cupcakes onto racks and let cool completely. While the cupcakes are cooling, make the frosting by whipping the cream and sugar until stiff peaks form. Fold in the lavender buds. Alternatively, you can heat the cream, add the lavender buds, chill the mixture for a few hours, strain out the buds, then whip the lavender-infused cream. Either way works wonderfully, it just depends on whether or not you mind the presence of the lavender buds. Carve out a cone-shaped bit from the top of each cupcake. Squirt or spoon in some of your lemon curd. 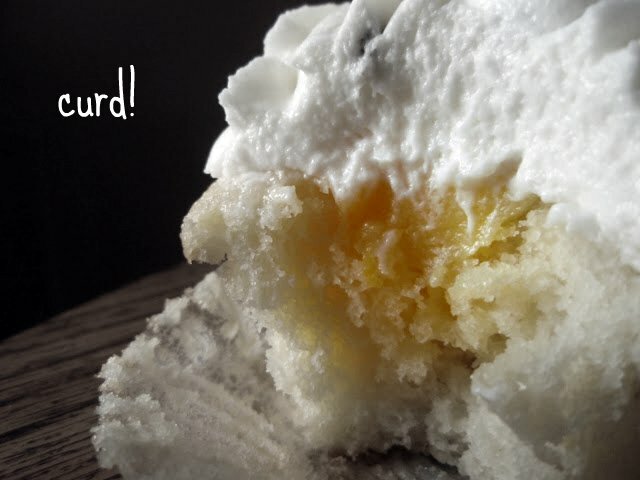 Top the curd-loaded cupcakes with the frosting and eat! I don't mind a little touch of violet, rose or orange flower water, and I LOVE nasturtiums and squash flowers, but lavendar smells like my grandmother and I just can't get behind it in cooking. A delightfu flavor! Those cupcakes look so moist and tempting. I'm a bit mixed on the lavender front but I will eat ANYTHING with lemon curd. These look lovely! I made some lemon-lavender bars from Joy the baker cookbook and they were delicious!Those cupcakes look amazing! Waw, Grace! Your filled cupcakes just look wonderfully & must taste amazing & are just so tasty! W have a lavender farm a few kilometres from here so culinary lavender is easy to come by. I have some lavender in my pantry. Can't remember what I made with it, but I do remember you have to be cautious as it can be strong. Like the idea of balancing it with the lemon curd. I'm always a bit concerned that adding edible flowers to my baked goods will make them taste like bath and body works smells. But with the right recipe I'm sure that's not the case. These cupcakes look delicious! They look very pretty and Spring-y. I have to say I like rose and jasmine but still working on lavender. I love food flavored with lavender so these are right up my alley though the hubs doesn't care for it, sigh. Your cupcakes are amazing Grace! I've never tried cooking with lavender, but have been curious about it.Now I shall have to give it a try. Love the lemon curd in these beauties too-my mouth is beginning to water! Lemon curd makes me swoon. These babies look seriously addictive! I've mostly dabbled with nasturtiums and calendula in the edible flower area, but I'd love to experiment more with lavender. Matched with lemon, it sounds delightful in these springy cupcakes! I love lavender with citrus, but it took a while to find the right balance. These look lovely! i have yet to bake with lavender. i will, soon i hope. there is a lavender shortbread i've got my eye on. Loving the curd inside the cupcakes! I have never had lavender buds, but now I want to try them...they make the frosting look extra pretty, too! I am la lover of lemon anything and especially the lemon curd! I've never eaten lavender, but these cupcakes are so pretty. You can never go wrong with lemon curd! 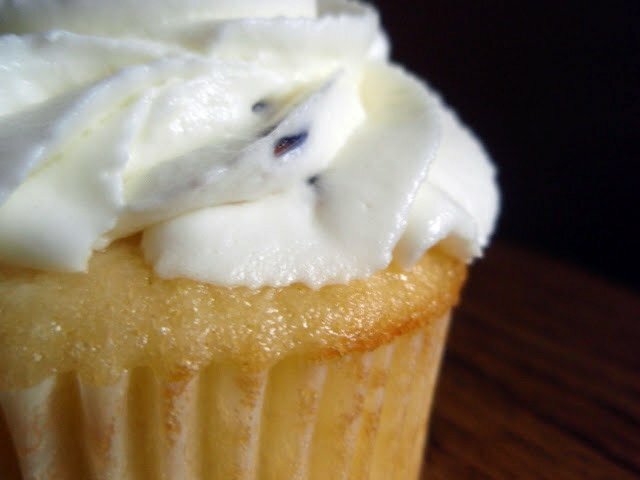 I had lemon lavender cupcakes (made by a real chef) a couple years ago that were amazing! Unfortunately, I failed miserably when I tried to cook with lavender myself. If my lavender has any essence left, I may have to give this a try! Yum. I make a lavender sorbet that is one of my favorites! It was kind of strange to me when I first started eating it too, but now! I love it. I made little lemon and lavender tartlettes. Delicious. I must say I totally love your curd filled cupcakes. I love the fragrance of lavender. Always makes me feel like I'm at the spa, even if I'm not. I think these cupcakes are pure aromatherapy. This is a very interesting recipe. I think I'm gonna try it. Don't want to miss up on these spring-y cupcake recipes. I actually have some lavendar in my cupboard, but I've always been too afraid to use it. Maybe I need to try these out to break it in! I'm not sure if I've ever eaten lavendar before. These cupcakes look so pretty and moist - you wouldn't have to twist my arm to give one (or two) a try!